Texas Cancer Centre CEO Dr Nyongesa Set to Meet First Lady Today. 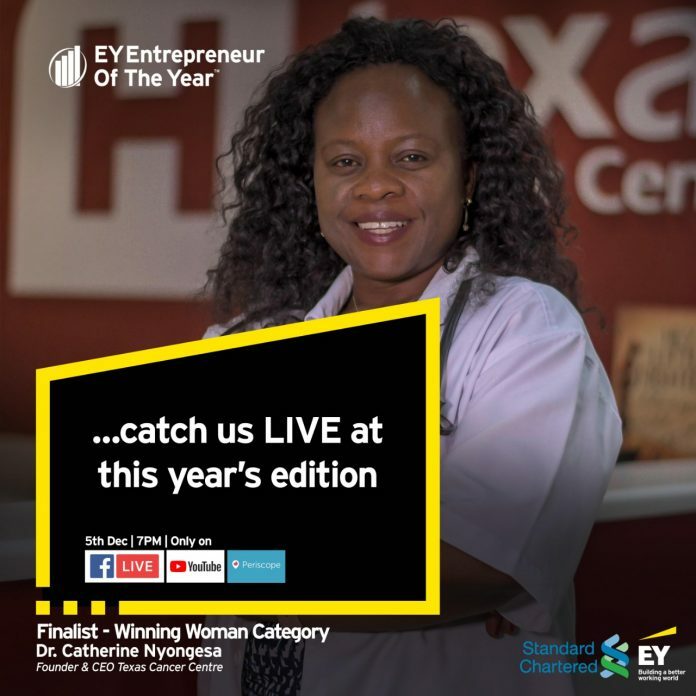 Texas Cancer Centre founder and CEO Dr Catherine Nyongesa has been nominated for the prestigious Ernst & Young Entrepreneur award (2018). The ceremony is slated for Tuesday December 4 and another one on Wednesday December 5 at the Raddison Blu Hotel in Nairobi. Dr. Nyongesa will face off with the likes of Bonfire Adventures founder Simon Kabu, Cellulant CEO Ken Njoroge and NIBS founder Lizzie Wanyoike. A panel of judges will decide and announce the winner, who will then go on to receive regional and international recognition, and a place in the pantheon of entrepreneurial greats. Dr Catherine, an entrepreneur in her own right, is the first female radiation oncologist in Kenya, boasting of an impressive decade-long career. She founded Texas Cancer Centre in Mbagathi to offer radiotherapy, chemotherapy and palliative care, after noticing a gap in the treatment of cancer patients in the country. Today, it is the largest private cancer hospital in East Africa, treating over 250 cases every single day. Another branch has been opened in Eldoret, to further bring cancer care closer to patients.